Bungay is an attractive and thriving market town situated in a loop of the beautiful river Waveney which straddles the Norfolk/Suffolk border. It has many individual and specialist shops, some of which have been established for generations. As it’s a mere ten minutes motorbike ride from me I took the opportunity to go undercover to find the best sausages on offer from the town’s three independent butchers. Bairds (£3.00lb approx), Lyalls (£3.20lb) and John Groom (£2.71lb) are all based in the town or on the outskirts. 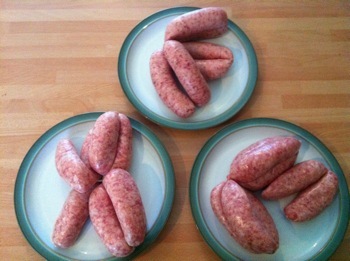 In each butcher I bought original or “plain” pork sausages to allow for a fair comparison. I also enlisted the help of some family members to get some extra opinions. I hope our friends over at Rate My Sausage like our scientific approach to this one. In order to make the process even more fair I hid the butcher’s names and we referred to the sausages as A, B or C.
On raw appearances I had a clear winner in mind as two of the trio were a bit wet and this was reflected in the shrinkage on cooking. However, regular readers will know we are all about the taste and when cooked the field looked very different. The votes were counted and the winner was sausage A.
Sausage A, B and C were sampled here again and sausage A still edged in as the winner. Bairds – Undercover sausage winner! Glad you liked the sausages, next time you pop in why not try some of our gloucestershire old spot sausages, I brought out bairds some 5 months ago and made a lot of changes, I breed my own Gloucestershire old spot pigs, they live outside of course on our small holiding where we also rear our own free range chickens, ducks, geese etc in Earsham, we now have bairds where we sell truley local meat from our own small holding, not many butchers shops can say they actualy rear there own products.. we started doing all this as we hate what supermarkets do and wanted good home food for ourselves and it just grew and grew..we now send our old spot pork and chickens all over the country, yes people in scotland love our chickens, one of the comments we get is they say they taste like chickens did when they where children. GREAT stuff here, we have a raid on Bungay in the pipeline! 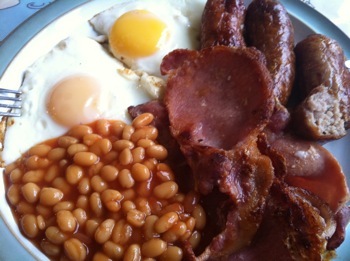 The sausages do look enticing….but I am slightly worried. Your approach to sausages is like Steve McQueen from The Great Escape – far roaming, unconventional, entertaining! (Cooler, sixtten days). My approach is like Richard Attenborough – methodical, analytical, reserved, BORING! So, to hear you even utter the word “shrinkage” filled me with horror! Keep doing your thang, Sausage King. Don’t let yourself be dragged down to the Rate My Sausage level of anorak-ness! You have so much more to give! All that said (tongue in cheek), this article is ace. Keep frying!